The David C. Shaw Arboretum at Holmdel Park was established in the fall of 1963. 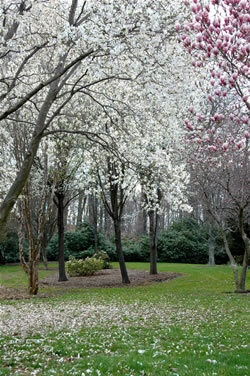 Its 22 acres contain hundreds of species, cultivars and varieties of ornamental trees and shrubs. The Arboretum is an educational and horticultural display devoted to the culture and study of many kinds of trees, shrubs and other woody plants that grow in Monmouth County. The goal is to educate homeowners about the many excellent varieties and cultivars of woody plants that can be used in their own landscapes. The Arboretum is named for David C. Shaw who served as Monmouth County Shade Tree Commission superintendent from 1963 to 2002. The installation of the Arboretum was one of Mr. Shaw’s first projects.